3020 with JY5300 Controller Box. NEW Controller and Remote released in July 2013! The remote controller MHC2 is inluded. It does not included in this package by default. NEW RELEASE AT JULY 2013. 1 USE Z shape arm (16mm Aluminium), can use the whole 300mm table and more reasonable on mechanical of the gravity weight of the motor. 2 BACK AL Panel enhance the strength. 3 Front black plastic panel prevent dust and particle inside the screw part. 1 Z axis change from 80mm to 90mm. Manual for CNC3020 V2 Machine. 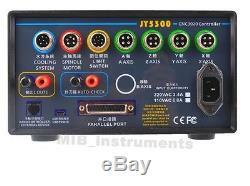 Manual for JY5300-2 Controller Box and MHC2 Pendant. ========= With the Remote controller in action: =========. CNC TO 3D Printer Video. You can ask us if you are interesting. COMPARE OLD V1 AND NEW V2. 1 Enhanced Z shape arm, more room for Y axis. 2 15mm thickness Aluminum Alloy 6061. 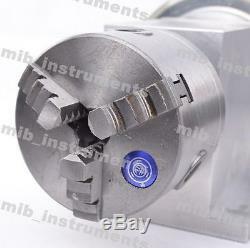 3 X Axis Front protection plate, avoid dust on the ballscrew. 4 X Axis back metal plate. 5 Z axis moving protection cover. 6 Trimming screw nut, reduce the gap of the ballscrew. 7 MHC2 pendant support MACH3, with 16 buttons, include autocheck, go to half new function. Hand wheel is not included in standard package. CONTROLLER BOX, SUPPORT MHC HAND WHEEL CONTROLLER (hand wheel is optional). NEW SPINDLE & STEPPER MOTOR. WITH 6 LIMIT SWITCHES INSTALLED. 80MM Z Axis, SUITABLE FOR LARGE OBJECT. 3A HIGH CURRENT STEPPING MOTOR, HIGH SPEED AND STABILITY. 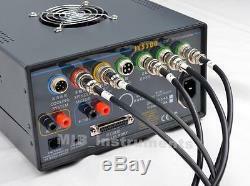 Digital hand wheel controller MHC-2. 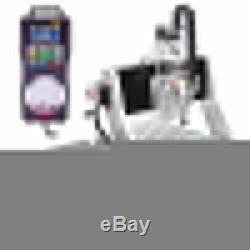 Can record the motion from Computer e. Mach3, or hand wheel controller. Can play back the whole motion without computer controller. 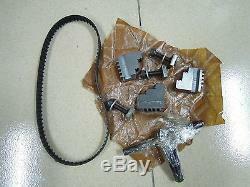 (Need MHC-1 Hand wheel controller). Hand wheel controller with LCD display, can show X, Y, Z and A position up to 0.01mm. Hand wheel control motion smoothing function. Embedded acceleration and deceleration in hand controlling. Can independently control up to 5 axis stepper motor (standard package is 4 axis) without Computer connected. Constant speed spindle motor function. Can detect spindle motor speed and provide more power automatically once the speed is dropped down. Fulfill low speed high power usage. Spindle motor overcurrent protection, prevent motor board and motor damage. PWM spindle motor control with electronic acceleration and deceleration, extent the life of motor. X, Y, Z axis Limit switches anti-crash function, once limit switch is triggered, the machine will automatically drive back 5 mm, prevent crash accident. 1 pcs main board, 4 or 5 pcs stepper controller board and 1 pcs Spindle motor controller board. Easy to maintenance, repairing and replacement. High velocity performance, velocity can drive up to 3500mm / minute, acceleration up to 400mm/s. Extension function can connect to 800W or above water cooling type AC spindle Motor controller Detail can consult sales. MIB MINI CNC 3020 is suitable for Industry, Technology Research, Advertising Design, Arts Creation, Teaching, Student Project and Hobby Purposes. MINI CNC 3020 is a desktop CNC machine and designd for processing Industrial or Hobby Prototype Building, Building Model Making, PCB, Adverstising Signs, Artwork, Crafts, Aircraft Models, RC Model parts, etc. 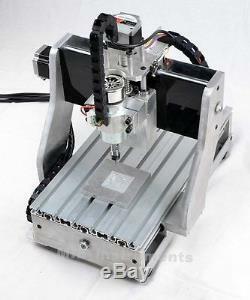 Small size CNC can let you work in home or office. CNC Frame and MOTOR Specification. 200(X) X 300(Y) X90(Z) mm. 410(X)540(Y)440(Z) mm. 240(X)440(Y)20(Z) mm. X, Y, Z (2 switch per axis). 57 2 phase 3A 1.8 Degree (Brand New). 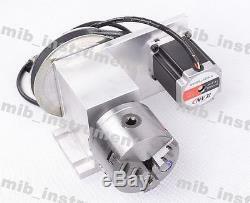 Spindle Motor Free upgrade to 300W NOW. Brand New DC Motor - Torque. 12 - 48 Volt DC. 2800 - 11500 RPM, Power. PWM up to 13000 RPM. Max No Loading speed (X, Y, Z). 0.01 - 0.04mm. G code/TAB files/nc file/NCC files. Win2000 XP (Support Mach2 Mach3). Standard package with 4 Stepper Driver Board. DC Spindle Motor Driver Board. One Region Max Record Time. Tested in 300W 12000RPM DC Motor. Dot Matrix 128X64 with backlight. 3 Claw middle to bottom. Height 105mm X Width 175mm. 3 fingers Claw Chuck Size. 3A 57type 1.8 Degree Stepper Motor. Ratio: 1:6, 12 teeth to 72 teeh. First Installation in 30 minutes. Locating the CNC machine on s table desk. Make sure that your computer has a on-board parallel port output. Install control software and Drive such as the MACH 3 or EMC2 (You can search easy in Google). Connect the X, Y, Z and Limit Switch socket from machine to CNC controller, connect power cord (We have already set the right voltage according your country). Follow our instruction on the MACH3 setting. Include one 3A Stepper Motor, 80mm 3 Claw Chuck, Holding Aluminum frame, Belt, 80cm long cable with socket (suitable for MIB CNC3020 control box). Mounting Screw Set (Suitable for table of CNC3020 or similar). 0.2mm V cut graver. 0.3mm V cut graver. 3.175mm flat milling graver. 1 MHC-2 Hand Wheel Controller is USD99USD/ pcs. New remote released in July2013, with more buttons, please refer to photos about. The same price but more features. 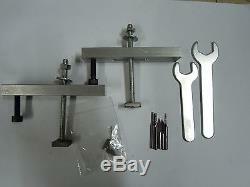 Desktop Clamp additional cost is USD80 / pcs. 3 Tail - Stock, For additional USD100 only. Upgrade Spindle motor to 300W. You may be interested in converting your cnc to 3d printer too, we can provide the kits. Manual For CNC 3D printer kit. Manual for CNC To 3D Printer. Manual for MC3D 3D Extruder. Manual for M3D-H2 Heater Controller. 1 Does the machine come with software? No, the package does not include software. This machine is compatible to Mach3 and EMC2 software, they are shareware and could be downloaded from their official website. There are also a lot of Mach3 and EMC2 tutorials from the web. Please google them or check youtube for online tutorial. 2 Can this machine mill steel and how thick can it mill? Yes, it can mill steel but not very efficiently. User can set mill step for each run, say 0.2mm in the software to experience the effect. Milling steel is possible but may not be efficient with the default motor. We have a high power (water cool) motor with 800W power, 24000RPM. 3 What is the power of the spindle motor? 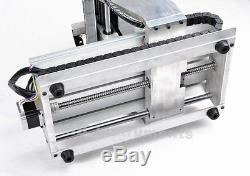 The spindle motor is 180W, it can be used to work on plastic, wood, aluminium and other soft materials. Before packaging, we will run 4 hours burn in test and then pack all accessories. The next day, we will send the parcel to our forwarder to get all the paperwork done. On the 4th day, we will have a shipper's reference number then the DHL waybill number will be published on the 5th day. You are welcome send questions / comments to us anytime. 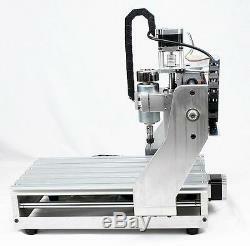 We will try our best to solve any question regarding the CNC machine. You can ask us for more detail. Since the parcel weight 35Kg, some countries do not allow parcel over 20Kg, so have to send by 2 parcels, we will send the aluminium flame and then the controller box. These counties include Russia, Brazil, CZ, Eastern Europe and Latin America. It depend on your location. The item "ROUTER CNC3020 4-Axis CNC 3020 ENGRAVER DRILLING MILLING MACHINE +MPG +Fullset" is in sale since Friday, October 24, 2014. This item is in the category "Business & Industrial\CNC, Metalworking & Manufacturing\Woodworking Tools & Supplies\Equipment & Machinery\Routers". The seller is "ds_dealsmart" and is located in default, default. This item can be shipped worldwide.